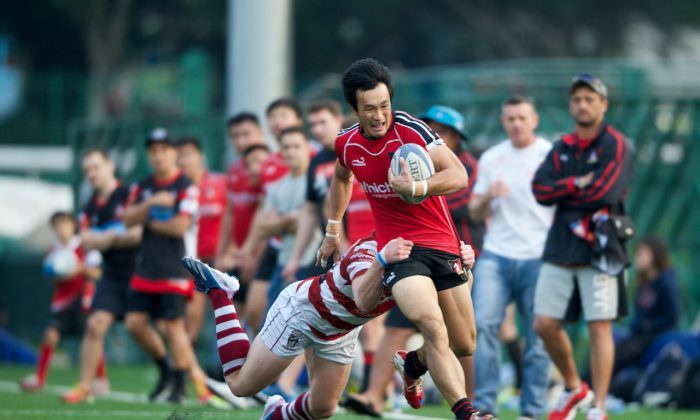 Leighton Asia Hong Kong Cricket Club won 31-20 against Newedge Club in the Hong Kong Rugby Football Union Premiership on Saturday Dec 7 to give the standing’s leaders their seventh win out of eight games. HKCC’s points were scored with tries by Pale Tauti (2), Brad Raper, Danny Amatu and Angus Cameron, while Cameron also kicked two penalties. Newedge Club scorers were Mike McKee and Stewart Shaw with Niall Rowark adding a penalty and a conversion. Significantly, HKCC are now on 34 points, three ahead of WhichWay Valley (31) as the league takes its Christmas and New Year break. WhichWay Valley, playing at home, won against visitors Abacus Kowloon 26-13. Valley scored with tries by Lee Jones and Salom Yiu, while Ben Rimene kicked 4-penalties and two conversions to add 16 points. Kowloon were held down to 13 points allowing Valley to retain the Broony Quaich Trophy over the festive period. With five points the maximum possible outcome from a victory and three points separating them, the HKCC and Valley wins were most important considering that they have a postponed match outstanding. In the bottom of the table game, Hong Kong Scottish beat Borrelli Walsh Tigers 39-13. With HKCC in first and WhichWay Valley second, their opponents from last weekend, Newedge Club and Abacus Kowloon, remain on 23 and 19 points respectively. Meanwhile, HK Scottish progressed to 16 points. Borrelli Walsh Tigers remain on a worrying 1-point. The Premiership now takes a break for the festive season and will restart with what could be the defining match in the league’s season – the postponed match between Valley and HKCC on Tuesday Jan 7, 2014 (venue not yet decided). Round 10 of the competition is on Saturday Jan 11.